Habit: [Annual] perennial herb (5)10--29 cm, often glaucous, pungently scented. Stem: erect to spreading, branched from base or throughout. Leaf: alternate except 1--4 proximal pairs opposite, generally 1-pinnately lobed, lobes generally 5--11, bristle-tipped, each lobe with +- terminal, embedded oil gland. 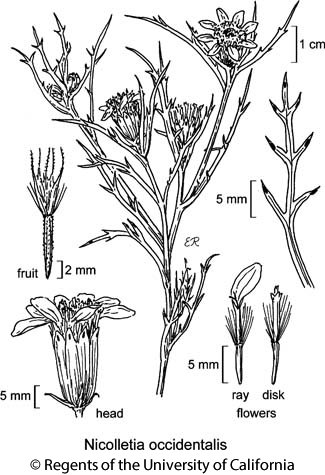 Inflorescence: heads radiate, 1; bracts subtending heads 2--4, deltate to lanceolate, each with 1--5 oval to linear oil-glands; involucre 4--8(10) mm diam, bell-shaped to obconic, cylindric, or fusiform; phyllaries 8--12 in +- 2 series, free, linear to ovate, persistent, most with 1--5 oil-glands; receptacle convex to conic, +- pitted, epaleate. Ray Flower: 8--12; corolla +- white to pink, ray sometimes with +- pink to +- purple stripes. Disk Flower: 30--100+; corolla yellow, purple, or +- white, tube << cylindric throat, lobes deltate to lanceolate; anther tip +- lanceolate; style tips thread-like, minutely bristly. Fruit: club-shaped, sparsely puberulent, hairs generally +- red; pappus of 5(6) bundles of 7--15 minutely barbed bristles subtending and alternating with 5(6) lanceolate, 1-awned scales. Habit: Plant deeply taprooted. Leaf: 2--7 cm, 1° leaf axis linear, lobes +- linear-cylindric to linear, 1° leaf axis width mostly 2--3 × lobe width. Inflorescence: peduncle generally 2--10 mm; bracts subtending head 4--8 mm; involucre 14--18 mm, obconic to cylindric. Ray Flower: ray 4--9 mm, 2.5--4 mm wide, pale pink to bright pink-purple. Disk Flower: (30)60--100+, corolla 8--9.5 mm, proximally yellow, distally purple to red. Fruit: 7--9 mm; pappus bristles 3--7 mm, scales 6--8 mm. Chromosomes: 2n=20. Citation for this treatment: Bruce G. Baldwin, adapted from Strother (2006) 2012, Nicolletia occidentalis, in Jepson Flora Project (eds.) Jepson eFlora, http://ucjeps.berkeley.edu/eflora/eflora_display.php?tid=4189, accessed on April 24, 2019.
e edge s SNH, DMoj; Markers link to CCH specimen records. Yellow markers indicate records that may provide evidence for eFlora range revision or may have georeferencing or identification issues. Purple markers indicate specimens collected from a garden, greenhouse, or other non-wild location.